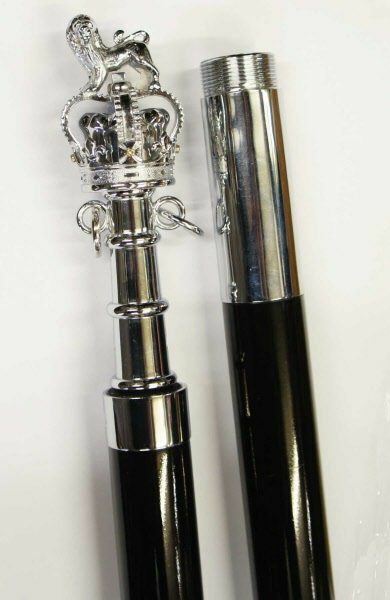 Black 8 Foot flagpole with chrome fittings and crown and lion finial. Ceremonial Flagpole in black and chrome fittings. Ceremonial Flag Poles in wood with chrome fittings. Superb quality finished wooden ceremonial flag pole. This pole comes with polished chrome fittings with crown and lion final. The pole splits into 2 parts and joins with screw fitting. Lovely dark wood finish. This is in the most common size of 1.25 inches by 8ft so it will be the same as 90% of other flag poles. New quality items.